Who’s behind those Nigerian scams? Seacom cable: Could East Africa become an outsourcing hub? *GlobalPost recently took down a lot of older content. I’m trying to restore access to some of my stories on my blog. Until then, use the contact form (link above) to request a copy of a story if you need one. The Global Imagination of Protest, with Anya Schiffrin on the protest movements of 2011. Context Be Damned: Reactions Against Saviors and Survivors from the R2P Camp. The Case for Reentry Courts, November 2012. *California Lawyer Magazine folded in 2015. Contact me (link above) if you want to see one of these pieces. 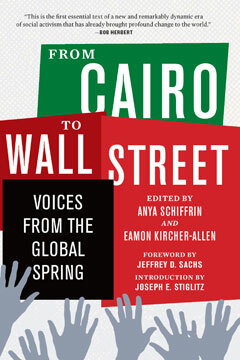 I edited a book, From Cairo to Wall Street: Voices from the Global Spring, with Anya Schiffrin (New York: The New Press, 2012). I co-designed and edited Communique, the newspaper of Columbia’s School of International and Public Affairs, throughout 2008. I researched and wrote for There Will Be Ink (PDF), a study of journalism on the extractive industries in Ghana, Uganda and Nigeria, which I coauthored along with several other Columbia students and Columbia professor Anya Schiffrin. Many other articles in Lebanon’s Daily Star.